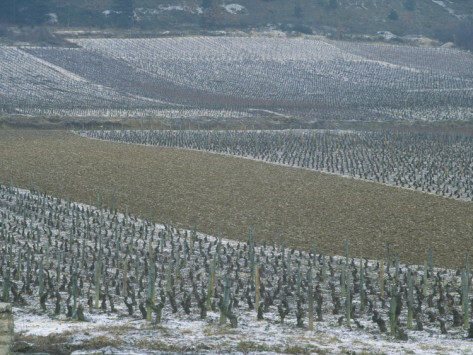 The vineyards of Burgundy in the winter (image source). 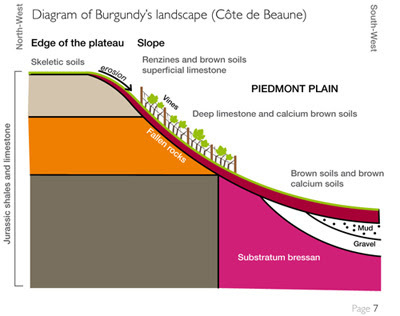 Burgundy is a long, narrow region (image source). In today's Tour des Terroirs, we're going to the place with two names: Bourgogne, aka Burgundy. The wines of Bourgogne (bohr/goh/nye), known as Burgundy in English, follow French winemaking tradition in emphasizing the terroir. Burgundy is just southeast of Paris, landlocked in the middle of the country. The name comes from the ancient Germanic settlers; these roots are reflected in the Norwegian city of Borgund. built in the 14th century (image source). Dijon - the same place where the famous mustard comes from, a recipe that originated in 1856. Dijon's history stretches much further back: originally founded as a Roman settlement since it lay between Lyon and Paris. Continental, with cold winters and hot summers, but a lot of rain to make sure their prized grapes don't get thirsty. Because of the harsh winters, that sometimes threaten the harvest, these grapes are suited to withstand frost and snowfall. Côte de Beaune is one of the sub-sections of Côte d'Or. 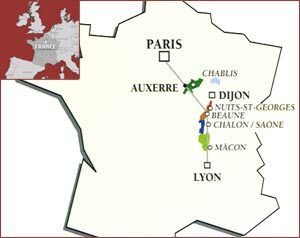 Its partner is Côte de Nuits (image source). Small, only producing about 22 million cases of wine per year over 70,500 acres - which in part explains why wines from Burgundy are generally more expensive than other regions. Burgundy wines come from un-blended grapes, setting the region apart from Bordeaux. Red - Pinot Noir, and the lesser quality Gamay. Pinot Noir grapes are notoriously hard to cultivate, but the special terroir, namely the limestone, of the region allows for great cultivation. White - Chardonnay, and the lesser quality Aligoté and Pinot Blanc. The limestone also benefits the taste of the white wines, so even though Chardonnay is easy to grow outside of Burgundy, these regional whites are special. Has all this chat on the beauty and deliciousness of Burgundy made your mouth water? 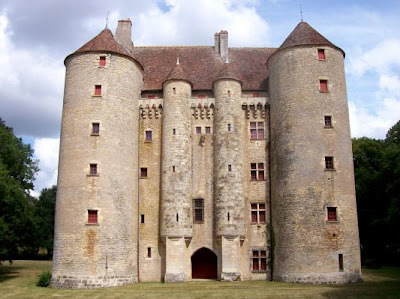 Well why don't you VISIT BOURGOGNE with a private French cruise offered in the Live Auction? Or, we have lots of tasty Burgundian wines to choose from in the Wine Market Auction. See ya there!